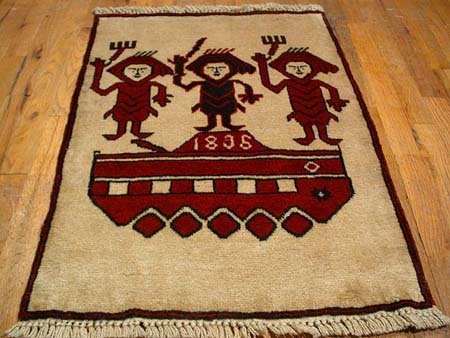 On this link you will find all the war carpets included in Max Allen’s Battleground exhibition at the Textile Museum of Canada. 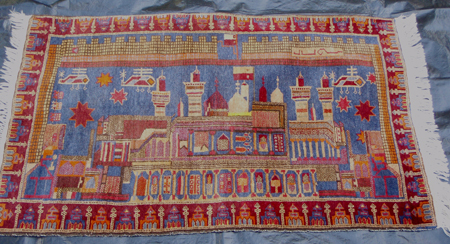 Do any of our readers recognise the subject of this carpet? Read the response to Max Allen’s exhibition here. Here’s a National Post article about Max’s show at the Textile Museum in Toronto. Bravo! This carpet, which has just appeared on internet dealers’ sites, references the memorial monument at Darb Qandahar, a busy street intersection in Herat. 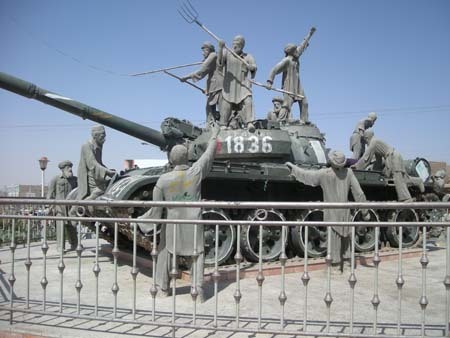 On evidence provided by Nasser Halimi, the monument was created in 2002 on the instigation of the then Governor of Herat Ismail Khan. Nasser has discovered that the figures were sculpted by a local mason, trained in Iran, named Khalifa Rahman, who now lives in Zeyarat Jah, in Herat province. The monument memorialises the defeat of the Soviets, which (it could be said) began with the Herat uprising in March 1979.
because we’re in the process of switching to a new site, and repairing the archives. Please be patient! is the name of Max Allen’s exhibition in Toronto. More coverage once we see it!